A 42-year-old emmetropic South Asian woman was referred as a glaucoma suspect based on subtle thinning of the inferior rim of the left optic nerve (Figure 1). Figure 1. Optic disc photography shows slight thinning of the inferior rim in the left eye. In 2015, her IOP was 16 mm Hg OU, visual field testing and OCT scans were normal, and the angles were open, with posterior trabecular meshwork visible for 360º despite a steep iris approach. Two years later, the angles had narrowed; they had become appositionally closed for 90º, and only anterior trabecular meshwork was visible over a further 180º. IOP was 19 mm Hg OU. Visual field testing and OCT scans remained normal, and the optic nerves were stable. Prophylactic laser peripheral iridotomies (LPIs) were performed, after which the angles were open with posterior trabecular meshwork visible for 360º despite a steep approach (Figure 2). IOP was 15 mm Hg OU. Figure 2. 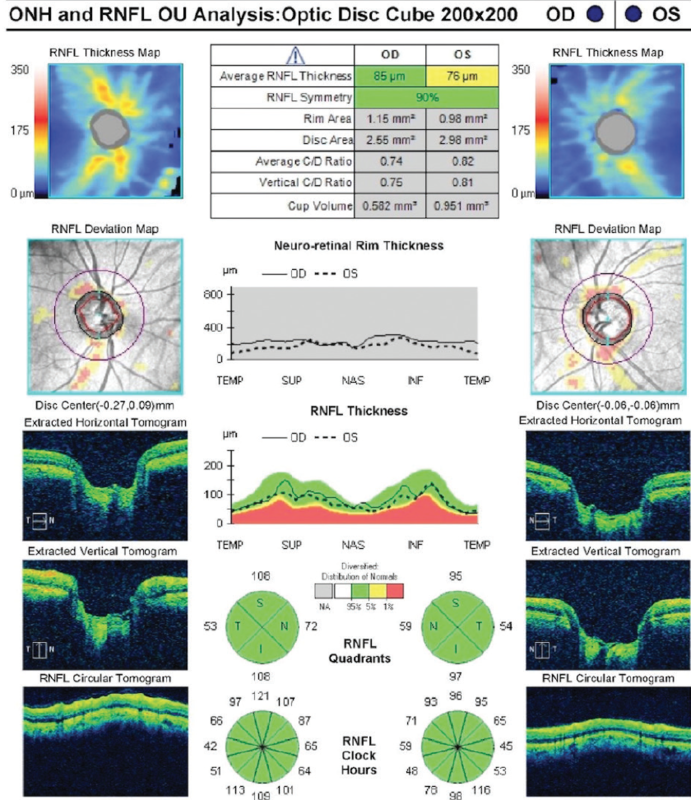 AS-OCT imaging of the left eye before and after LPI. The angles are narrow preoperatively (A). After LPI, pupillary block has resolved, and the angles are open (B). Figure 3. AS-OCT imaging shows recurrent angle closure despite resolution of the pupillary block. The patient’s right (A) and left (B) eyes. At a recent examination, IOP was 16 mm Hg OD and 19 mm Hg OS. The referring optometrist found the angles to be closed for 180º and narrow, with only anterior trabecular meshwork visible over the remaining 180º in each eye. Anterior segment OCT (AS-OCT) confirmed that there was no pupillary block component and that the iridotomies were patent (Figure 3). OCT imaging showed worsened inferior thinning of the left optic nerve (Figure 4), and new visual field deficits were present in the left eye (Figure 5). The patient used the Icare Home tonometer (Icare USA) to measure her IOP several times daily over the course of a week; the unit detected IOP fluctuation, with maximum readings of 24 mm Hg OD and 34 mm Hg OS (Figure 6). Figure 4. OCT imaging demonstrates new thinning in the left eye. Figure 5. Visual field testing shows new deficits in the left eye that correspond with changes on OCT. Figure 6. Home tonometry results (right eye in blue and left eye in red) show marked fluctuation in IOP in both eyes, with elevation greater in the left eye at several time points. The patient is asymptomatic for glaucoma and has no cataracts, and her UCVA is 20/20. How would you proceed? This is a challenging case. Optic nerve photographs document disc size asymmetry, which is confirmed by spectral-domain OCT. This asymmetry could explain the increased cup-to-disc ratio on the left, and nerve fiber layer analysis indicates relatively normal thickness in all quadrants. That said, overall thickness is somewhat thinner on the left, and the left eye has a higher IOP when measured in the office and at home. Visual field testing shows scattered defects in both eyes, and there is no clear glaucomatous loss on the left. Visual field testing bears repeating because there may be a rim artifact. In short, I am not sure that this patient has glaucoma. Had I seen her in the clinic, I likely would have followed up with her twice a year, and I might have offered IOP-lowering therapy, given the difference in IOP of 3 mm Hg and—of greater concern—the findings for the left eye. Readings with the Icare Home tonometer raise concern that in-office measurements are underestimating IOP throughout the day and confirm that IOP is higher in the left eye. Despite possible errors in measurement at home, the facts that IOP readings in both eyes tend to track and to be elevated at around the same times suggest real fluctuation. Also, several of the IOP spikes in the left eye have been present on multiple measurements done at around the same time (although the actual timeline is not provided). So, what to do? The Effectiveness in Angle-Closure Glaucoma of Lens Extraction (EAGLE) study enrolled individuals who were 50 years of age or older who had primary angle-closure glaucoma and IOP of 21 mm Hg or higher and patients who had angle closure and IOP of 30 mm Hg or higher. These patients were randomly assigned to treatment with either LPI and medications or primary early lens extraction. Those who underwent primary lens extraction had better IOP control and significantly better self-reported quality of life 3 years later.1 The current patient would not have qualified for the EAGLE trial based on in-office IOP measurements, but the high IOP measurements at home would have met the entry criteria. She has already had LPI, moreover, and is younger than the study population. I would like to have the patient undergo diurnal IOP testing in the office in hope of confirming fluctuation, but, regardless, I would lean toward treatment at this point. Some practitioners have performed iridoplasty on patients like this one; several recent articles have documented that the technique produces a short-term IOP reduction, but evidence of long-term effectiveness is lacking. This patient is 42 years of age, so lens extraction could leave her suddenly presbyopic. That said, lens extraction could be offered, and a multifocal IOL could be considered. Lens extraction would likely lower the IOP (the lens is vaulted into the anterior chamber), and the patient probably would not require medication to control IOP. Alternatively, one could simply prescribe IOP-lowering topical medication or even attempt laser trabeculoplasty if the trabecular meshwork is mostly visible. Whatever course is chosen, a fairly long discussion with the patient will be required. It would be helpful to take a step back and determine the root cause of this patient’s pathology. Although LPIs successfully removed pupillary block as a factor, gonioscopic examination revealed an angle at risk of closure. She remains an angle-closure patient, and her disease continues to progress during episodes of intermittent, asymptomatic angle closure. AS-OCT confirmed findings from the gonioscopic examination but did not provide structural information posterior to the iris root. 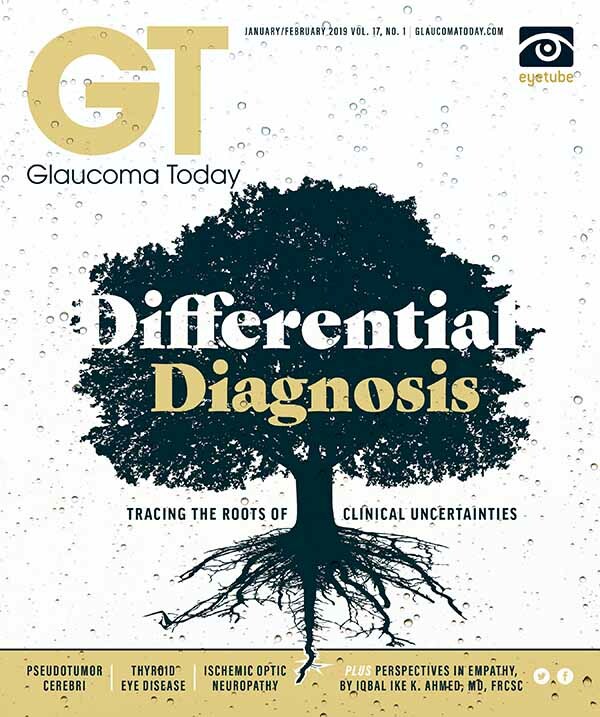 Indentation gonioscopy and ultrasound biomicroscopy could help identify large or anteriorly rotated ciliary processes consistent with plateau iris, which might be in play here. Although the patient’s disease is still relatively mild to moderate, she has already developed visual field loss in one eye and has demonstrable IOP instability in the other eye. My preferred treatment at this point would be clear lens extraction, potentially combined with endocyclophotocoagulation to shrink and posteriorly redirect large ciliary processes, if such were identified on ultrasound biomicroscopy. The discussion with the patient could well be challenging, especially if she is prepresbyopic, but the prospect of an anatomic “cure” of the disease’s root cause generally appeals to patients and clinicians alike. Argon laser iridoplasty could be considered, but the procedure carries the risks of peripheral anterior synechiae formation, cosmetic changes to the iris, and IOP spikes. The fact that the patient can maintain an appropriate IOP in between spikes increases my confidence that her IOP will stabilize after lens extraction without the need for adjunctive outflow procedures. Based on the new field loss and optic nerve deficits in the left eye, I thought this patient’s status had converted to primary angle-closure glaucoma. The progressive narrowing of her angles and evidence of fluctuating IOP with significant elevations raised my concern about ongoing progression that, given her age, could lead to symptomatic vision loss within her lifetime. I decided treatment was indicated and discussed with her the options of medical therapy, laser iridoplasty, and lensectomy. I recommended lensectomy because it would address the underlying mechanism and because, based on the EAGLE Study, I thought the procedure would provide the best long-term result. The patient was highly motivated to maintain her reduced dependence on glasses and was willing to consider a presbyopia-correcting IOL. After a thorough discussion of the rationale for, risks and benefits of, and expectations surrounding lensectomy, however, she was not ready to commit to a surgical solution and asked for a month or 2 to consider her options and discuss them with her family. During this time, our plan is to monitor her closely for disease progression or the development of synechiae. 1. Azuara-Blanco A, Burr JM, Cochran C, et al; Effectiveness in Angle-closure Glaucoma of Lens Extraction (EAGLE) Study Group. The effectiveness of early lens extraction with intraocular lens implantation for the treatment of primary angle-closure glaucoma (EAGLE): study protocol for a randomized controlled trial. Trials. 2011;12:133.